Sinister forces draw together a cast of desperate characters in this eerie and absorbing novel from Yoko Ogawa. 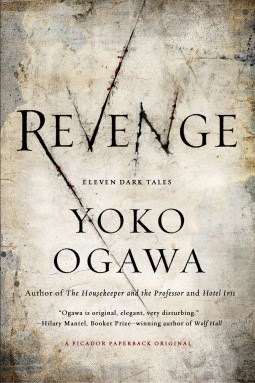 Macabre, fiendishly clever, and with a touch of the supernatural, Yoko Ogawa’s Revenge creates a haunting tapestry of death—and the afterlife of the living. I was quite impressed with the quality of Ogawa's writing. She's an author who had never even crossed my radar until I stumbled across this collection (I think from NPR's year end list?). She has a decent back catalog, all of which I've added to my TBR list based on the quality of writing from these stories. Each story is linked to the next, but in tiny ways. I found myself searching each story for the connection, but the stories can stand by themselves as well. My personal favorite was "Sewing for the Heart," which features a handbag-maker who becomes possessed by envy. The supernatural plays a very minimal role in these stories. Honestly, I'd be much more likely to describe them as darkly surreal than supernatural. They reminded me (in an excellent way) of George Saunders' stories with a decidedly dark twist. Not oppressively dark, though. There's not gore or explicit descriptions of violence (despite one of the short stories being about a Museum of Torture). They're just eerie and deliciously creepy. I loved this collection and will be looking for a copy to add to my home collection. If you like eerie, twisted, macabre, this collection is for you. Don't be automatically turned off by the "dark" descriptions though - there's an almost fairy tale like quality that cuts through the darkness and makes them a delight to read. These are so good! I hope you love them as much as I did.